The second and third editions of the Alchemical Tarot came with a little white book with the basic meanings of the cards. The fourth edition did not. For those, who have the fourth edition and do not have the companion book, the contents of the little white book are posted on this page. Feel free to copy this information, paste it in a file on your computer, and print it. In August, 1987, during the time of the Harmonic Convergence, I was studying an alchemical image that symbolized the Philosopher’s Stone, the mystical goal of the alchemical work, and I had a flash of insight. It seemed that the image had unlocked a secret door in my mind and in an instant I saw that the alchemical Great Work and the story told in the Tarot’s trumps were interchangeable. I immediately picked up my copy of Jung’s Psychology and Alchemy and began to make notes in the margins next to the alchemical images comparing them to Tarot cards. This was the beginning of a process that would take several years. 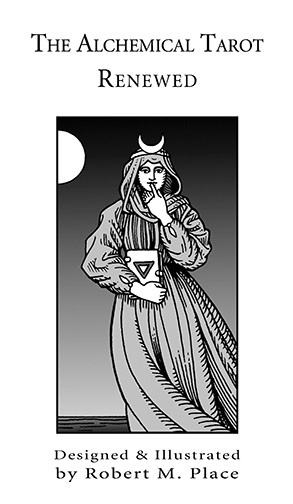 The fruit of this insight and labor was the The Alchemical Tarot, which was first published by Thorsons in England, in 1995. In this new edition, the illustrations have been improved and the columns that flanked the cards on the original have been removed. The images are larger, filling more of the card. In keeping with the explicit nature of alchemical symbolism, the image that I originally drew for the Lovers card was sexier than the censored version that was published by Thorsons. This edition has both versions of the Lovers. The Fool and the trumps in the Alchemical Tarot each relate to an alchemical material or process, which is part of the Magnum Opus (great work) of alchemy that leads to the creation of the Philosopher’s Stone, a mystical catalyst that transforms what it touches into its highest form. Composed of a mysterious fifth element, it can cure any illness, turn lead into gold, and turn an ordinary person into a sage. The Philosopher’s Stone is represented by the World card. The four minor suits are related to the four mundane elements: Earth, Water, Air, and Fire. And each of the elements is related to one of the four functions of consciousness as described by Jung: sensation, intuition, thinking, and feeling, respectively. Thus the feminine elements align with the passive observational functions: sensation and intuition, and the masculine elements align with the align with the active decision making functions: thinking and feeling. II. The High Priestess – begins the separation of the elements – she is Water, esoteric spiritually, intuition, a secret, or something that cannot be spoken – her book has the triangle of water but it is the color of Fire. All are free to copy this material for personal use but not for resale without permission form the author. Thank you so much for this! I just purchased the deck today, so this helps very much! Many blessings! I just received my second Robert M. Place tarot deck. They are both beautiful, I had intended to not open the second one (The Alchemical Tarot: Renewed) but I couldn’t resist! It reminds me of my other deck, King Solomon Oracle Deck. I had to open it and touch each card! I have a special request and I have no idea if this is where to leave it but it is so important to me, my heart to try. I have your first deck. It is precious to me for the one card my little son chewed on (he was lost to me at 18 months and the heartache has been very difficult). My Father also died the year you published this deck. It actually has a lot of positive and loving memories. Unfortunately 2 cards were lost during a move. I know people consider these collectors but this deck was a beautiful piece of my little family. The cards missing are the Ace. Rabbit in the hole and the boat. Is there anyway I could find these two cards so I could have a complete deck again? Thank you and compliments on your fine work and creative insights. I often replace missing cards for mt most recent edition but I do not have any cards from my first edition. Sorry. I am very grateful for your efforts. It is quite a loss but I thank you for trying. Sorry, I don’t have any extra cards from he first printing. Hi, I have received the 4th edition Alchemical Tarot – powerful imagery. Do you sell the Little White Book separately? I travel with my work and the book would be great to have with the cards. Thanks. Sorry, I do not, but you can download it from my website and print it yourself.